How do you measure the effectiveness of a politician? How can you tell if the new voter identification laws will affect your ability to vote? What are your chances of being frisked by a New York City police officer based on the neighborhood you are in? In each of these cases – there’s an app for that. Over the weekend the Sunlight Foundation, NPR and The Washington Post sponsored the 2012 Election Hackathon – an event organized to bring Web developers together for a two-day programming jam session to create political apps for the upcoming election. The contest is setup to allow developers 26 hours to build a Web-based application using an interface from one or more of the three sponsoring organizations. Simply explained, the interface is a set of formatted and usable data that can be sourced by the unique application. For example, Justin Myers of the PBS NewsHour worked on an app to compare political candidates based on their sponsored legislation, voting history, and campaign contributors. The app sources information provided by Sunlight’s application programming interface, or API. 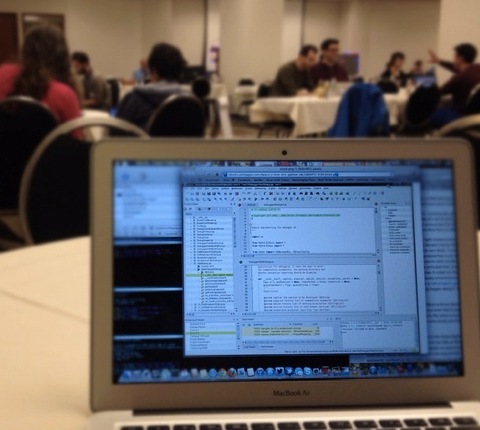 For the developers, the hackathon is appealing because it allows them to collaborate and compete for prizes. For the sponsors, the event gives exposure to their API’s and the data they have available. “This is the first time we have done this and ideally they are going to build something that will be useful,” said Dave Goldberg, director of API products at The Washington Post. Cameron Hickey came from New York City with his wife Lauren Feeney to participate in the two-day event. They worked on an app creating a political influence score (similar to what the analytics company Klout has developed for social media) for every legislator in Washington. “The idea for this [application] is to have something that will live on after this election. This app is not specific to this election. Because of what it does, I think it can continue to be relevant,” Hickey said. Hickey’s application uses an algorithm he developed to score legislators based on input such as the number of committees they serve on, the number of bills they sponsored and the number of times they have visited the White House to come up with a unique score for each member of Congress. The scores are displayed on a baseball card-esque interface. The app won first-place over the weekend and Hickey plans on continuing to develop it once he returns to New York. “I would like to keep working on it. I spent a lot of time here working on the display and the data input so I’d like to take some more time to perfect the way it calculates the scores and change a few other things about it,” he said. A complicating factor for the further development of the apps is the licensing of the code and the usage terms for the API’s. The code belongs to the developers so the sponsoring organizations cannot use the app without the developer’s consent. But the API is the property of the front-end developer and the code is useless without the data. This much is certain: if any of the developers and hosts can agree to produce some of these political apps, there will be some amazing new tools for voters to use before heading into the voting booth in November.